The Texas Gulf Coast Council of Diving Clubs once again hosts Texas Trashfest on the Comal River in New Braunfels on Saturday October 3, 2009 with diving for trash in the Comal from 8:00 am to 3 pm. Teams of up to 8 (including non-divers who serve as grounds crews) can register early until September 25, 2009 for $40. Regular registration is $60. All divers must have their C-Card. Crews are responsible for providing their own trash bags and for transporting the trash to the collection site. A celebratory barbeque is included with registration. Last year over $27,000 in door prizes were distributed to participants. Headwaters Coalition plans September 17 th Third Thursday "Invasive Plant Attack" and October 15th "Trail Day"
On the third Thursday of each month, the Headwaters Coalition takes on a work project in the headwaters area of the San Antonio River on the grounds of Incarnate Word University. The work takes place from 12:30 to 4:30 pm. September 17th will be an "Invasive Plant Attack". Volunteers will remove Ligustrum along the central trail loop. Ligustrum is native to Japan but considered invasive in south Texas. Snacks and water water and tools will be provided. Volunteers are asked to bring refillable water bottles and to advised to wear sturdy boots and long pants. Meet at the sanctuary entrance by the double soccer fields. October 15th will be "Trail Day". Volunteers will help build and repair trails. Snacks, tools and water are provided, but again boots and long pants are advised. Albuquerque , NM – Indigenous Peoples from all over North America will converge at Acoma Pueblo this fall to actualize an inter-tribal campaign to end the latest uranium boom threatening communities throughout Indian Country. The 7th Indigenous Uranium Forum will take place October 22 – 24 2009 in Acoma Pueblo at Sky City Hotel , New Mexico . The Forum started in 1987 with a series of conferences on the environmental and health impacts of uranium development in the grants mineral belt in New Mexico . Over the past 22 years, the Forum has grown into an important vehicle for strategy development and coordination of communities affected along the entire lifeline of nuclear power – from uranium mining in the grants mineral belt, to nuclear waste storage at Yucca Mountain . “For the first time in sixty years, indigenous peoples in North America has the greatest opportunity to stop further uranium/nuclear development and to promote renewable energy”, stated Anna Rondon. The political climate is perfect for us to organize ourselves nationally. “We hope to leave the forum with clear actions as we continue the resistance of corporate/government invasion of nuclear developmental terrorism on our homelands.” The forum is spiritually based and will have private ceremonies. Due to the United States ’ recent energy policies, which emphasize nuclear power as a solution to climate change, uranium mining is going through a boom. Historically the negative health, economic, and social impacts of nuclear power has fallen on the back of Indigenous Peoples. Although the forum will focus much needed attention on the uranium developments being proposed at Mount Taylor and throughout the grants mineral belt of New Mexico , it will also provide education on a variety of topics, from the health affects of uranium mining, to the implications of U.S. energy policy, to the opportunities provided by the emerging green economy. Most importantly, it will provide an opportunity for communities to network, organize, and strategize. Find more information about the 7th Indigenous Uranium Forum by visiting the website at www.siuf.net/index.html. Build San Antonio Green presents "Green Your Home", Saturday September 12, 2009 from 10 am to noon at Lion's Field House, 2809 Broadway, San Antonio, 78209. Topics will include how to improve your home's energy and water efficiency, your indoor air quality. Site preparation and green building materials will also be discussed. The workshop to address renovations according to the Build San Antonio Green "Green Retrofit" program. This event is geared to the general public and should be of great interest to anyone who is interested in how to fix up their house in a resource efficient manner. The cost is $25 and includes a copy of the BSAG "Green Retrofit Homeowners Recommendations". A contractor's guide with more detailed information is also available. Call BSAG for information on how to qualify to obtain it. * Food Safety Bills: What's Happening in Congress? * Organic Certification: How do Farmers and Consumers Make the Choice? This conference will also give you the tools you need to take action to protect your farm and your food supply! There will be speakers on how to lobby, creating social networks, and approaching the media. At the end of the conference, you'll have the information you need to be effective in making your voice heard on issues important to you! REGISTRATION: Register online or download the registration form to mail in. Early registration ends September 1! 3:45-5:15: Certified Organic or Not Certified? How Do Farmers and Consumers Make The Choice? The Headwaters Coalition has completed a master plan to guide further development of the headwaters of the San Antonio River which was put into the protection of the Sisters of Charity of the Incarnate Word by San Antonio philanthropist George W. Brackenridge . This master plan focuses on physical aspects of sanctuary stewardship (ecological restoration and visitor infrastructure). As such, it represents the beginning of strategic planning for the Headwaters project and will be followed with collaborations that target the equally important areas of education and scholarship, spiritual exploration, and cultural heritage (see Goals, below). While thetHeadwaters Coalition views its mission holistically, we recognize the need to divide a large planning project into stages; this sanctuary master plan is the first piece of a larger whole. Within this document we attempt to outline the process by which we will restore and maintain the ecological integrity of the sanctuary land and facilitate public access. 1. Ecological Restoration: Restore and maintain the ecological integrity of the sanctuary to the degree possible, and allow for natural variation over time. 2. Cultural Heritage Preservation and Spiritual Exploration: Protect and celebrate the cultural heritage associated with the Headwaters, through education and through the continuance of cultural uses. Support spiritual exploration through understanding historical spiritual use, engaging in spiritual experiences, and bringing forth the sacred nature of the land. 3. Education and Scholarship: Use the sanctuary as a platform for educational programs covering such topics as ecology, environmental sustainability, human history with the land, nature and spirituality. 4. Sanctuary Visitation. Provide a restorative, broadening and safe environment for humans, while always respecting and protecting the natural community. You can find a pdf of the Master Plan executive summary here. With water making headlines as “liquid gold” and “the new oil,” a debate is heating up over whether or not we need to have meters on private wells and over how much authority we need to give regulating bodies as our creeks dry up and our wells go dry and new developments of thirsty families keep on moving in. We feel the time is right to invite consumers of water, recreationists relying on water, land managers, and public policymakers to gather for an event centered on appreciation, awareness and actions we can take to ensure a sustainable future for this precious resource. 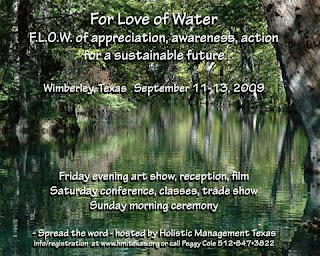 The purpose of this event is a celebration of the allure of water and its role in our quality of life; awareness of the water cycle and how it affects decisions on water use, the sustainability of available water; and actions people can take individually and collectively to conserve water use, seek the best sources of water, manage toward a healthy water cycle, and decide wisely how this shared resource is best used. We kick off the event with a reception and art show on “The Allure of Water” Friday evening, September 11 from 5:30 to 9:00 pm. We are planning a “quick draw” art & auction event and a screening of the documentary film The First Millimeter: Healing the Earth as guests enjoy wine, beer and appetizers. The Saturday conference will feature speakers, panel discussions and breakout workshops on the magic, the art, the science, and the business of water. We have Aldo Leopold winner J. David Bamberger coming to talk about managing land for maximum water. Decision makers and water regulators will tell you how these important decisions are made and answer your questions. The issues and aspects will be addressed on the local, the regional and the state levels. We are partnering with as many organizations as possible on this one, including National Wildlife Federation, Wimberley Valley Watershed Association, Dixon Water Foundation and more to come. A Sunday morning ceremony at Jacob’s well combines a number of traditions including a rain dance. Costs to attend the event are $20 for Friday evening, $25 for Saturday (lunch included) or $40 for the entire event. Sunday ceremony is free. Register with Peggy Cole (512-847-3822) or below and watch the website for more details as the event flows together. The American Recovery and Reinvestment Act needs a catchier name. How about "Cash for Clunkers: Home Edition"? Cash for Clunkers was a big success. But the program that gives even more money to homeowners who improve their energy efficiency hasn't caused a rush at the dealers. Perhaps its because the American Recovery and Reinvestment Act just isn't a catchy name, so based on a comment by Stephen Colley, long time SASL coordinator, we're going to call it "CASH FOR CLUNKERS: Home Edition". The home edition of Cash for Clunkers is quite a bit more complicated than the automobile version. Tax credits are earned for installation of energy efficient devices. The IRS is still working on the final guidelines on what products qualify and on what documentation is necessary but until they do, they say to rely on manufacturer ratings and keep all your receipts and communications with sellers and installers, so there's no need to delay. IRS:Energy Incentives for Individuals in the American Recovery and Reinvestment Act . Of course, our standard SASL disclaimer applies. (See the sidebar.) Do not rely on this site for tax advice. Hanely Wood, the trade magazine publisher, has a great site that explains the act with regard to home improvements, www.thestimulussource.com and a regularly revised chart showing the home improvement Stimulus at a Glance. Some improvements qualify for an unlimited 30% tax credit for all costs including parts and labor. These include: Geothermal HVAC Heat Pumps and Solar Water Heaters, Photovoltaics and Residential Wind Turbines. Fuel Cells and Microturbines earn a credit of 30% including parts and labor but limited to $500 per .5 kW capacity. This is the big credit, and you can receive credits for each of these you purchase. This is the heart of CASH FOR CLUNKERS: Home Edition. The smaller credit is a maximum of $1500 when you spend $5000 (equipment only, no labor included) on a long list of qualifying improvements. The Congress set the standards high for these improvements. They include energy efficient windows, doors, roofing, insulation, biomass stoves, conventional central air conditioning, heat pumps HVAC (both split and the usual), furnaces and hot water boilers and theoretically water heaters, though as of today there are no qualifying models. Although there are lots of categories for the smaller credit, you can only receive a total of $1500 in tax credits. 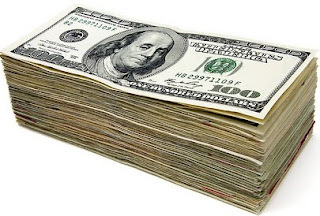 Your credit is 30% so to get the maximum of $1,500 you must spend $5000. Any amount above $5000 will not earn additional credits in this category. To me the really exciting thing about "CASH FOR CLUNKERS: Home Edition" is the unlimited credit for renewal energy items. Of these items, Solar Water Heaters and my favorite, Geothermal HVAC are great deals. Southwest Mechanical Services estimates that in South Texas a geothermal system (which includes free hot water heating during A/C season) costs 35% more than the most efficient conventional system, including labor and the drilling of holes for a closed loop. With a 30% credit you get upgraded practically for free. Even without a tax credit the energy efficiency of the geothermal will eventually make up for the price difference. Hard numbers are hard to come by because there aren't any double blind controlled HVAC studies but Southwest estimates that a geo system is 2 1/2 times as efficient as a 13 SEER HVAC heat pump. Aside from the cost, geothermal is the one HVAC system that is just as effective when it is 105 degrees outside as when it is 88 degrees. Even if it didn't pay for itself, which it does, it pays for itself in comfort. My family's geo system cost $26,000. Under this program we would have received a $7,800 tax credit. There are also CPS and state financial incentives to explore. So what are you waiting for? Go out and trade your home clunker in and get some cash! Photo courtesy of Almagill on Flickr with a Creative Commons license. Here's the sort of creative solution that carpenters can come up with when they set their minds to it. A Mooney wall (created by Mike Smith and Tim Mooney and introduced to the world on Tauton Press's "Breaktime" discussion forum) is intended to upgrade 2 x 4 stick construction by reducing energy loss due to thermal bridging. Instead of attaching drywall directly to the studs which creates a thermal bridge all along the stud, drywall is attached to 1 by 2 strapping that is attached to the studs thereby reducing the thermal bridging by 80% or more. For pictures and a more complete description go to builditsolar.com's Mooney Wall article, or look for the discussion on Tauton Press's Breaktime. Yes, I survived six summers in San Antonio with a whole house fan as my primary cooling. A whole house fan is not an attic fan, though it exhausts into the attic. A whole house fan is usually mounted in the ceiling of a hallway. It is very powerful and draws outside air in through open windows and pushes it out through the attic. In doing so it makes the inside as cool as the outside and does the same for your attic. In my leaky 1920's, clapboard with interior shiplap covered with thin drywall, the fan drew air not just through open windows but also through almost invisible and not so invisible gaps in the wood floors and through the holes around electrical outlets. The house doesn't have a hallway so I mounted in toward the center of the house. The fan worked great. San Antonio does actually get a little cooler at night and I slept much better with the gentle cooler breezes seeping and flowing through and heading up into my attic. My house was very comfortable from bedtime until 10 am well into a typical June and even in August, it was comfortable until at least 9 am. It was much more comfortable than it would have been without the fan. But, it was extremely noisy. Just the amount of air flowing through is loud but the fan itself makes quite a clamor. A belt drive whole house fan costs more than a direct drive model but the belt drive ones are supposed to be quieter. I had a direct drive one. To talk on the phone I often had to turn it off. I also had to be sure to turn the fan off before the outside temperature started to rise. If I left it on all day, then the fan would bring all the hot outside air in. But if I turned it off at the correct time I would have a load of slightly cooler air inside to enjoy. In my case part of the air was coming from beneath my house which was cooler than the outside air. Until about mid-June or July the air passing over the ground in my crawl space was slightly cooled by it. But eventually the air flowing over it warmed that ground too. The renters of my old house with the whole house fan don't use it. Instead they run a window unit 24 hours a day. It much quieter and they probably have much less dusting to do but it costs them a lot more. Today so many people try to get by with barely using their central air systems, but if I was trying to do that I would definitely install a whole house fan. I'd use a belt drive model to try to minimize the noise and I'd mount it in a hallway, not a room I intended to use. At bed time or a little earlier, I'd open up the windows and turn it on. In the morning I'd turn it off and shut the windows. That would give my central air a fighting chance during the rest of the day or if I kept the AC off my inside would be at least as comfortable as the outside would be with a gentle breeze. I lived for six years with a whole house fan and I'd do it again if we didn't have geothermal or if I found myself single and living in that 1920's house again. Want to live and build green in South Texas? The Instant Jobsite Translator book can help. When you need help working on your home, knowledge of Spanish can be very valuable. Some of the best craftsman working in south Texas are monolingual. The great faux-beaux artist Dionicio Rodriguez communicated only in Spanish. There are a number of English to Spanish / Spanish to English guides that specialize in phrases that are useful on a construction site. One that seems especially well thought out is the "Instant Jobsite Translator" from Construction Communication Corporation of Cheyenne, Wyoming. At 3 1/2 inches by 5 inches and 120 pages, it is truly pocket sized. At $5.00 it is less costly than the guides you'll find in bookstores. It does not attempt to teach grammatically correct Spanish instead it gives the sort of primitive forms that will allow you to get work done. An extra copy or two to give to the craftsmen you work with regularly you can be well on your way to a fruitful multi-cultural construction collaboration. How to make your fridge even more efficient than a chest freezer: Use a chest freezer as a fridge. Sometimes when you hear a solution to a problem it seems so obvious you wonder why you hadn't thought of it. This is one of those solutions. Refrigerators either use a lot of energy or like a SunFrost cost a lot of money. Plus in a building that is largely soundproof to outside noise such as buildings built of Compressed Earth Block, SIP, ICF or SCIP the whirling and rattling of a refrigerator can be really irritating and loud. On the other hand a chest freezer is quiet (because it doesn't need to run very long) , very energy efficient and cheap. The solution from Tom Chalko of MtBest.net is to use a chest freezer as a chest refrigerator by modifying the chest freezer so that it cools to between 35 and 38 degrees Fahrenheit degrees rather than the 5 degrees Fahrenheit proper for a chest freezer. He even designed and built thermostats to do it and published an article on it in 2005, which was picked up by Treehugger and BuilditSolar.com back then. Apparently homebrewers and keg drinkers have been modifying chest freezers for their needs for some time, but the idea comes to this blog of Boing Boing which published on it today and linked to the 2005 pdf of an article by Tom Chalko of MtBest.net on builditsolar.com. On Mt. Best.net Australia you'll find these items by Tom concerning freezer to fridge conversion: Chest Fridge, an essay putting out some reasons that energy saving chest fridges ought to replace uprights, Freezer to Fridge Conversion, which shows a kit for making a freezer to fridge thermostat and assembled thermostats both of which are for sale, a pdf of two articles by Tom Chalko explaining and diagramming his thermostat and a pdf of a parts list for building the Tom Chalko freezer/fridge thermostat. (I don't know enough about electricity to say whether these would work as is on freezers made for the USA market.). In the USA chest refrigerators are available but since they are made for the commercial market or for patio kitchens they are not cheap. As much as we look at new ways of construction in our meetings, it has long been said that the least destructive house is the one that is not built. So living in existing housing on land that has already been taken from agricultural production and laid out with streets and the rest can be a green way of life, (especially if you can somehow make those leaky uninsulated houses energy efficient or live with a lower level of air conditioning and heating). In the city's many historic districts, homeowners face the challenge of improving the efficiency of their homes and altering them to meet modern needs while satisfying the requirements of the Historic Review Board. The Historic Homeowners Fair planned for Saturday August 29th from 9 am to 1 pm at the Municipal Auditorium may be of help whether you live in a historic district or not. It is free to all. Planned sessions include improving energy efficiency, repairing wood windows, green living in historic properties and appropriate additions to historic homes. An exhibitor's fair is also planned. It has long been recognized that San Antonio lacks adequate park land. During his term, Mayor Howard Peak saw the opportunity to transform the city's creeks (which had been transformed in some cases into drainage ditches) into linear parks. 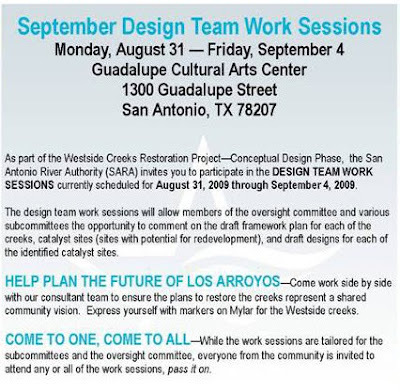 The San Antonio River Authority is behind the current design phase assisted by R J Rivera Associates. August 31 to September 4 will be a week of intensive work on the project at the Guadalupe Cultural Arts Center, 1300 Guadalupe Street, San Antonio 78207. Each evening a committee will take a look at potential designs for each creek. Although the sessions are designed for the committees and sub-committees each is completely open to the public. Don't miss this chance to help transform a large section of our city into more sustainable and nurturing neighborhoods. One night in 2008 Michael Janzen went to sleep with Jay Shafer's tiny houses on his mind. Since then he has been imagining a series of homes each with an area of 9 square feet and documenting his thought and google sketch-up experiment on the blog "Nine Tiny Feet". The design has been altered many times since then. His last entry as of today was in May 2009 but in it he indicates that he is still contemplating the design. He has tried different shapes, has eliminated framing in favor of panels, has added and removed features. He is currently trying to figure out a way to make his design lighter. No construction has taken place as far as I can tell but the design keeps evolving. It is a thought experiment that has fascinated many readers. It illustrates the well William G. Wilson's statement "before a man can build a house he must first imagine it." In San Antonio the city's Mission Verde is seeking to make green building the standard. In September the USGBC Balcones chapter is bringing an expert on PasivHaus construction to speak. Meanwhile natural builders are making headway with compressed earth block construction in the Hill Country. Our own Build San Antonio Green gains recognition for its achievements. But what about Living Buildings? This concept comes from a USGBC chapter in northwest, the Cascadia Region Green Building Council which includes Oregon, Washington State, British Columbia and Canada in its territory. The Living Building Challenge is a program launched and operated by the Cascadia Region GBC. It is according to their website the "most advanced green building rating system in the world". It was conceived of and authored by Jason F. McLennan, CEO of Cascadia, prior to joining the organization. Living buildings are houses and offices designed to function like living organisms, specifically adapted to place and able to treat water on site among other things. Apparently some aspects of living buildings face obstacles in building codes and the reluctance of home buyers. Members of the International Living Building Institute can learn more about the Living Building Standards at http://ilbi.org/ . Access to information on the site is $150 for non Cascadia members. The Central Texas Zero Waste Alliance, part of the zero waste movement (far beyond ordinary recycling) will stop at nothing! The Central Texas Zero Waste Alliance (CTZWA) chapter in Austin is part of a national movement to eliminate the concept of waste entirely by treating "waste" as a resource in disguise. Related organizations include the Zero Waste Alliance, the Southwest Network for Zero Waste and Zero Waste International Alliance. 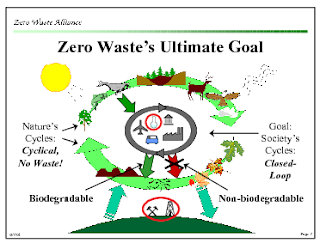 The case for zero waste is made in a 2001 power point "Zero Waste the Key to our Future" produced by the Zero Waste Alliance from which the two slides to the left were taken. 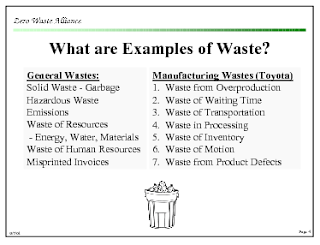 The concept of zero waste was also promoted in the book Cradle to Cradle by William McDonough and Michael Braungart. The idea is to move beyond recycling. To them recycling merely turns higher quality products into lower quality ones that are discarded. "It is not recycling, it is just slow motion waste" in the words of Amazon reviewer David C N Swanson. The CTZWA is committed to "the realization of a sustainable zero waste (or darn close) economy in Central Texas before 2040." They are working to educate about, advocate for, and promote Zero Waste in Central Texas, by working with the general public, elected officials, governmental staff, businesses, schools, Councils of Government, institutions, state agencies, religious organizations, non-profits, the media, citizen and environmental groups, and any other relevant entities. The CTZWA meets the first Wednesday of each month at 7 pm at 611 South Congress Ave Ste 200, Austin Tx 78704 (south of the river near Congress and Riverside). 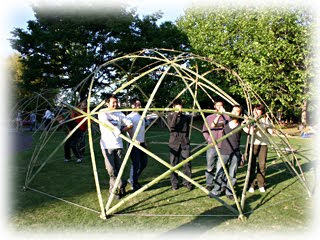 Stardome.jp offers plans to build beautiful bamboo domes. They even offer some minimal instructions in a mix of English, Engrish and Japanese characters with illustrations. Other supplies needed include braided rope and short pieces of rope for tying the split bamboo together. You'll also need a drill, work gloves, a saw, tape measure and a wood plane. Of course don't forget the large bamboo poles that you will split into slats. 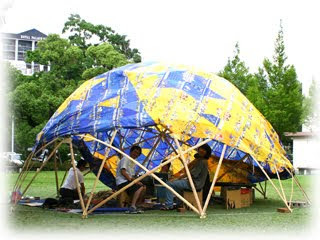 It takes only 30 minutes to assemble the split and tied bamboo into a dome though experts can do it in just 10 minutes. Anyhow it looks like a fun project if you can figure it out. Water-levels and bunyips are inexpensive easy to make tools that outperform some high tech costly laser levels in many situations. There are at least three basic DIY designs for different applications. All involve clear tubing and of course water. In its simplest form all is required is a tube. You partially fill it with water. Set the water line (aka meniscus) at the height you want and the water line on the other end of the tube no matter how far away is guaranteed by gravity to be at the same height. Appropriately sized corks for each end make transport around the site less likely to become damp. Here's an explanation of this simple form of water level by Kelly Smith on DIY Life. A reservoir or bucket and tube water level will be more accurate on a landscaping project where the goal is for a number of widely spaced objects to be absolutely level, or whenever you want multiple marks to be at exactly the same height. The bucket or reservoir stays in place as you move the one tube so that the water line at the end of the tube will always be at the level of water in the stationary bucket. Dale Williams on factsfacts.com has an excellent explanation of how to make a bucket style water level along with a second post explaining a a bit more on how to use it. Buildeazy.com has an illustration that may make it clearer how this type of water level is used for fence and deck construction on sloping property. A bunyip or "Egyptian water-level" is the tool to use when you want to measure differences in elevation. This is used for creating water catchment earthworks among other things, when you want to make sure that the bottom of your earthwork is a certain distance below the top or that your french drain has a proper slope. A bunyip water level requires a measuring stick, rod or post at each end to which the tube is attached. (Yardsticks can be used but typically the sticks used are longer and marked by hand.) When the bottom of each post is placed on the ground, the difference in elevation will be shown by difference in the from the meniscus on each to the top of the post or stick. For example if the meniscus at one end is four inches from the top of the stick and the meniscus on the other end is ten inches from the top you know that the ground at the second site is six inches higher. Here's a video by zhiniibones of Tuscon, Arizona that's the most complete explanation and demonstration on how to make a bunyip that I've run across. If making your own seems too difficult or if you have more money than time you can also purchase a wide variety of water levels at watrlevel.com. They make water levels specifically designed for building decks, foundations, making patios, mobile home leveling, installing siding laying brick, concrete forms, laying lawns, installing cabinets, grading home inspection, t-bar installation, pond construction and installing rain gutters. Solar San Antonio presents a Solar Hot Water workshop, September 3, 2009 at International Center 203 S. St. Mary's Street, Suite # 385, San Antonio. Tony Stephenson, of Solar Texas and long time member of San Antonio Sustainable Living will present information on Solar Hot Water Fundamentals, types of systems, sizing and determining the amount of storage and collectors, installation techniques for mounting collectors, options and types of pre-heat storage tanks, miscellaneous system components, sizing pumps and piping, procedure for soldering and supporting copper, pipe insulation, Controls, system fill and start-up, options for space and/or pool heating. Living Green in San Antonio on KSTX interviews Julie Koppenheffer, executive director of Green Spaces Alliance. Everything You Want to Know about Green Spaces Alliance. The audio begins playing as soon as the page loads. In the interview Julie gives a little history of Green Spaces which began life as the Bexar County Land Trust and explains the process of conservation easements to protect land from future development. The KSTX Town Hall is on an ongoing series of forums designed to engage the community on a wide range of issues impacting San Antonio. Moderated by Texas Public Radio's Terry Gildea, each Town Hall gathers a panel of thought leaders to share their expertise and spark a solution-based conversation about a particular issue. The Town Halls are free and open to the public. KSTX invites you to bring your questions and share your insights on the topic of discussion. KSTX also welcomes email questions and comments to townhall@tpr.org. Each KSTX Town Hall is recorded for broadcast on The Newsmaker Hour, which airs Friday evenings at 7 on KSTX 89.1 FM. 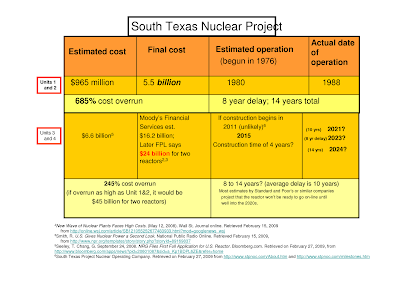 Here's a major event that is especially important since geothermal energy is proposed as a viable, steady, reliable and non-radioactive alternative to expansion of the South Texas Nuclear Project. The San Antonio Geothermal Symposium, is Saturday, September 19, 2009, at Trinity’s Chapman Center Auditorium. Speakers will discuss the feasibility of residential and commercial geothermal air conditioning and electricity generation. The talks will be geared to the public as well as to energy professionals. Please join us as we explore this often neglected generation source in which Texas has the potential to be the number one producer. South Texas has a particular feasibility for geothermal air conditioning and electricity generation. Geothermal is a clean, reliable source of energy that uses mature technology and is fuel-free. The cost and payback time for residential and small business geothermal are roughly equivalent to those of solar photovoltaics. The cost for central geothermal in Texas is projected to be lower than elsewhere because previously drilled spent oil and gas wells can be used for geothermal piping. Registration starts at 8 am. The program runs from 9 am to 12:10 pm and then from 1 pm to 4 pm. Link to pdf of agenda. Maria Richards , coordinator of Southern Methodist University’s Geothermal Laboratory, Stathis Michaelides, Chairman of the UTSA Department of Mechanical Engineering, and Glenn Kroeger, Chair of the Trinity University Department of Geosciences, will be among several speakers at this event. Registration includes continental breakfast, lunch and symposium presentations. Registered Professional Engineers will receive a certificate for 4.0 professional development hours. The registration deadline is September 12. Seating is limited so registrations will be accepted on a first- received basis until the auditorium capacity is reached. Register by submitting the registration form or by calling 210-999-7601. Link to registration form. The Chapman Center is located on the western edge of the Trinity University campus. Free campus parking is available in any student or faculty lot for this event. However, parking is not allowed on Rosewood Street. Link to map of Trinity University. Location of auditorium on Google Map. The San Antonio Geothermal Symposium is sponsored by the Trinity University Engineering Science Department in partnership with the U.S. Green Building Council Central Texas – Balcones Chapter, San Antonio Environmental Policy Office, San Antonio Clean Technology Forum, and University of Texas at San Antonio Mechanical Engineering Department. 1. I liked the shift in thinking of what a modern house is today to what it could be. 2. The idea that a home with a post and beam construction could be easily reconfigured since the walls are not load bearing fascinated me. How many homes are unsellable because a certain floor plan is no longer in style or its simply not what a prospective buyer is looking for? 3. I'm wondering why more homes aren't built like this. 4. Innovations like SIPs,etc combined with Old World engineering can give us an environmentally friendly house that easily last hundreds of years. Exciting stuff! Each time I attend an SASL meeting I learn something new. In the lead up to the meeting, it was news to me that a timber framing company existed in San Antonio, let alone that it had existed for 10 years. I was also interested to learn how affordable timber framing could be. I also found it interesting that the work of Sand Creek Post and Beam had been influenced by the work of Tedd Benson, who in addition to promoting open residential building also worked to bring modern automated woodworking machinery into timber framing. Jason was at our meeting to collect another video for OrganicTexas. You can view the set on his YouTube channel. * To register, click HERE. If you don’t already have a DBL account, you will be asked to create an account. Once you have created an account and are logged in, select “Current Events” from the “What would you like to do?” pull down menu. Walls built of straw bales offer incredible thermal insulation, sound isolation, beauty and permanence. Over seventy-five straw bale structures have been built in Central Texas over the last two decades, ranging from garden walls to three storey homes and even commercial buildings. The project is a 2,000 square foot home for Cindy and Eric Gerber, where the wood-framed floor, wood columns and SIP panel roof are ready to receive the straw bale wall infill. This workshop offers the fairly rare opportunity to learn how to stack straw bales on edge, as opposed to the more common flat position. Bill Christensen, founder of Sustainable Sources and one of the co-founders of the Sustainable Building Coalition (DBL’s predecessor), will lead the workshop. Fee for the workshop is $75 and includes a healthy vegetarian lunch and all necessary workshop materials and tools. Water, tea and snacks will also be provided. Enrollment is limited to twenty people. Register for the workshop HERE or contact Gayle at 512-478-9033. In his just published book, Green Building Trends: Europe, Jerry Yudelson of Tuscon Arizona explores the German Austrian concept of the PassivHaus or Passive House which is designed to use very little outside energy for heating or cooling, relying on the building and activities within the building to heat itself. He points out that while in the USA the government has worked to make commercial buildings more efficient, in Europe governments have focused on residential construction. His book also addresses green building in the UK, ecotowns, German sustainable building and takes a look at concepts that are well understood in Europe that need to be understood in the USA. You can read the first chapter of his book in pdf form here. Mr. Yudelson will be the featured speaker at a US Green Building Council Balcones Chapter lecture and mixer September 2, 2009 at the San Antonio Central Library from 6:15 to 8:45 pm. Tickets range from $27 for early purchase by USGBC members to $47.50 for purchase after August 24 by non members. Tickets are available from eventbrite, “Looking to Europe for a Greener Tomorrow” . The Passive House Institute US hosts the 4th annual North American Passive House Conference, October 16 to 18 2009 at the University of Urbana-Champaign. Improvised, poorly built dry stacked mixed brick rocket stove works nevertheless. I got the refractory bricks a year ago when I worked for a day with the great San Antonio house recycler and unbuilder, Mike Lowry. I intended to do something with them but didn't. I ran across a video showing how to make rocket stove from adobe bricks months ago and intended to write about it. My intention to write about it and my intention to do something with the bricks came together today and I stacked the refractory bricks and some others I had in the yard. I flattened a Dr Pepper can to form the platform on which the wood was placed. It actually worked. I even cooked a steak on it, which is not what rocket stoves are intended to cook. Real rocket stoves have a grid with a skirt going up from the chimney so that the gasses heat a pot on the sides as well as on the bottom. But, if this improvised dry stacked version of a rocket stove works just imagine how a properly built one would work. This video of Dr. Larry Winiarski shows one of many variations on rocket stoves. Nuclear industry's "Clean and Safe Energy Coalition" answers the question "Why nuclear?" The Clean and Safe Energy Coalition is an organization founded by the public relations firm Hill and Knowlton in 2006 and funded by the nuclear industry. Dr. Patrick Moore a spokesman for the organization will be in San Antonio in September and participate in the San Antonio Clean Tech Forum's San Antonio’s Nuclear Power Investment Decision forum. Lately, there has been an increased buzz around nuclear energy, with 17 consortia applying for 30 new reactors, editorials in support of nuclear energy in major national newspapers, and a wide variety of organizations that have joined the Clean and Safe Energy Coalition. Why are all these different voices supporting nuclear energy and what do you need to know to make your choice to support nuclear energy? Nuclear already provides 20 percent of the United State’s electricity and with electricity demands expected to increase 21 percent nationally by 2030, the U.S. needs more nuclear energy if it wants to keep up with our energy needs. Conservation alone won’t meet our growing needs and nuclear energy can’t be the only solution – a diverse mix of energy sources will serve us best. However, as we look down the road, we should promote an increase in the use of nuclear energy as the environmentally clean and reliable path to take in meeting our country’s needs effectively. * Nuclear energy is an environmentally clean option to produce electricity choice – it produces no harmful greenhouse gases suspected to cause global warming and no gases that could cause ground-level ozone formation, smog or acid rain. * Nuclear already accounts for 73 percent of the nation’s emission-free electricity generation and needs be used in compliment with other renewables. Alternative renewable energy sources are important, but can only take us so far – wind and solar can be unreliable and geothermal power isn’t well-suited for all applications. The other major sources of emission-free electricity are hydroelectric plants, which provide 6.6 percent of our nation’s electricity; wind energy, 0.4 percent; and solar energy, 0.01 percent. * Nuclear energy is a safe choice. For example, you would have to live near a nuclear power plant for more than 2,000 years to get the same amount of radiation exposure that you receive from a single diagnostic medical x-ray. * Nuclear energy is secure. A two-day national security simulation in Washington, D.C., in 2002 conducted by the Center for Strategic and International Studies (CSIS) concluded nuclear plants “are probably our best defended targets,” with the industry spending $1.2 billion in security since September 11, 2001. * With rising energy costs a concern for every American, nuclear energy is an affordable and reliable economic choice for electricity. Nuclear power has the lowest production cost of the major sources of electricity. Nuclear plants are the most efficient on the electricity grid and their costs are more predictable than many other energy sources. * Nuclear energy brings economic benefits. From new jobs around new plants to adding $430 million a year to the economy for each new plant brought on line, nuclear plants bring significant economic benefits. Additionally, employees at the plant earn an average of 36 percent more than average earnings in the surrounding communities, so the jobs are high-paying. Perhaps that is why an opinion survey, Zogby International, found that two-thirds of Americans (67%) support the construction of new nuclear power plants in the U.S., with nearly half (46%) indicating strong support for new plants. * Nuclear technology is on the cutting-edge of American innovation. One out of every three people hospitalized benefits from nuclear procedures. Nuclear technologies helps to make food and water safer and holds promise as a reliable means of producing potable water from seawater, a process known as desalination. Indeed, in its many uses, nuclear technology improves the quality of life for Americans. America was one of the first countries to realize the benefits of nuclear energy. But we are no longer alone. Many nations around the world depend on nuclear energy today. In 2005, a total of 16 countries relied on nuclear energy for at least 25 percent of their total electricity needs. Some, like France, generated 76 percent of its electricity from nuclear energy. Sunday, August 16, Energia-Mia, the San Antonio anti nuclear expansion coalition, will meet at the San Antonio Area Progressive Action Coalition offices (7122 San Pedro Ste #114, San Antonio 78216) at 6 pm. Topics will include a debriefing concerning recent Town Hall meetings, planning for a press conference on water issues related to the expansion of the South Texas Nuclear Project, plans for speaking engagements for Dr. Arjun Makhijani, author of Carbon-Free and Nuclear-Free: A Roadmap for U.S. Energy Policy among other works and Craig Severance, author of Business Risks and Costs of New Nuclear Power who will be in town to participate in the San Antonio Clean Tech Forum September 16, 2009 and planning for a community education event. The San Antonio Clean Tech Forum, begun in 2008 by former Tesoro Petroleum CEO Michael Burke, has launched a group website: www.sacleantech.org . The group which mainly focuses on big picture issues of sustainability related to government actions and industrial developments has already influenced public debate through their Mayoral Candidate Forum and other events. Their membership includes many people well connected to San Antonio's behind the scenes power structure, although it is also open to students and interested citizens. 1. Learn what technologies, programs, & practices are most appropriate for our region. 2. Communicate via major media the best ideas for saving money, energy, water and clean air. 3. Educate, train and develop our workforce for good paying new jobs in clean tech in the future. 4. Propose guidelines, programs and initiatives to direct investment & assure appropriate behavior. 5. Incentivize action - identify, encourage and communicate rebates, grants, & subsidies. 6. Finance entrepreneurial initiatives in resource efficiency and Alternative Energy. 7. Attract talent and businesses to accelerate the growth of the clean tech revolution. Their September 16, 2009 Nuclear Forum will include speakers who support and those who oppose the expansion of the South Texas Nuclear Project and San Antonio's funding of it. Tickets are $50 ($20 for students). The site includes a blog based on the frequent emails members of SACTF have received with links to news items of interest, descriptions of past events and (it is hoped) some past presentations. To pay for the site it will have paid members-only section with forums, exclusive content and discounts on SACTF forum tickets. Earthbag construction which uses earth or an adobe mix packed into bags and connected by strands of barbed wire between courses was developed by architect Nader Khalili, who first suggested it as a method of building on the moon. It was quickly found to be an excellent means by which refugees could construct their own housing. Today, in the USA earthbags are widely used to make foundations for natural buildings, as well as for whole buildings. The leading proponents in the USA include Doni Kiffmeyer and Kaki Hunter. Check out their website and book, Earthbag Building, much of which can be read on google books. 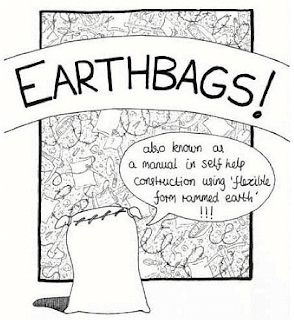 But if you want to legally download and print out a guide to earthbag construction, then Sourabh Phadke's primer "Earthbags! also known as a manual in self help construction in using 'flexible rammed earth' " is the way to go. It is 33 pages and has enough detail to get you started. Mr. Phadke has been advocating natural and self help construction in western India for several years. Here is an Indian produced video showing the basics of building an earthbag dome. For more videos of sustainable building and technology from India, check out the Antiismistix YouTube Channel. Using a catalyst of cobalt, phosphate and an electrode, professor Daniel Nocera reported in 2008 that he was able to split water into hydrogen and oxygen, which if perfected would allow for the storage of solar power in the form of hydrogen which could be used in a fuel cell. The professor's work is part of the MIT Energy Initiative and was funded by the National Science Foundation and a grant from the Chesonis Family Foundation which helped to launch the MIT Solar Revolution Project. MIT graduate student, Jing Cheng, is investigating another approach to generating energy: thermophotovoltaic, or TPV cells which use infrared radiation to produce energy. These cells are already in small scale use. The idea is that they would allow industry to capture waste radiated heat and convert it to electricity. The cells that Cheng is developing are intended to cost much less than current TPV cells to manufacture. LionForce spoke back in September at our monthly meeting and introduced us to their brand of affordable, green building using their version of STEP (Steel Thermal Efficient Panels) which combined polystyrene insulation with metal studs. Their home was open and efficient making good use of space and material. In July they learned they had received LEED Gold certification which is extraordinary considering that the home is a modest one. Last week, the LionForce ecoLiving home located on Trumbo Road in San Antonio, Texas, was awarded LEED Gold certification by the U.S. Green Building Council (USGBC) for achievement in green homebuilding and design. LEED for Homes is a green home certification system for assuring homes are designed and built to be energy- and resource-efficient and healthy for occupants. LEED certified homes complete a technically rigorous process that includes a home energy (HERS) rating and onsite inspections to verify that the home is built to be energy and water efficient, environmentally sound, and a healthier place to live. Trumbo Road (T-2) is one of 3 local homes that have been certified using LEED, but the first to achieve Gold certification. The home was built by LionForce Building Systems, which is known for their ecoLiving System that empowers people to design and build LEED-rated homes. Green homes have substantially lower utility bills and may qualify for advantageous financing, lower insurance rates and government incentives. Through their commitment to green homebuilding, LionForce is helping to keep homeownership affordable. Specific information about the home: The LionForce home located on Trumbo road was constructed with a unique wall panel system made from light-gauge steel and Expanded Polystyrene. The panels are factory-fabricated to precise engineering drawings to minimize site waste and shorten construction time. The LionForce wall system creates an extremely tight building envelope and significantly reduces the amount of energy consumed. Indoor air quality standards were met by following the 70-item checklist from the Indoor Air Package – provided by Energy Star for Homes, and a rainwater catchment system is used to capture 70% of the roof runoff to be used for irrigation. 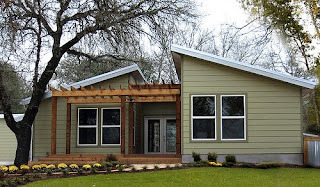 The home also received an award for “Best Custom Green Home” from the City of San Antonio, and the first and only Level 3 certification from Build San Antonio Green. San Antonio's Consumer Energy Coalition makes a case against CPS nuclear power expansion. San Antonio's Consumer Energy Coalition is a genuine grassroots organization. They describe themselves as "A citizens’ lobbying group looking for better ways to produce energy" and as "a volunteer group of citizens including pharmacists, lawyers, teachers, computer analysts, small business owners, doctors, environmental planners,and more who believe: To supply our future energy needs we can either generate much more, or use what we have more productively." They believe that "San Antonio should spend rate-payer money on energy efficiency, renewable energy and co-generation.These are clean, inexpensive, distributed, fuel-free and available now. San Antonio should not spend tax-payer money on nuclear power plants or coal power plants." They are an active participant in the anti-nuclear coalition Local Power / Energia Mia www.EnergiaMia.org which is operating in high gear to oppose the expansion of the South Texas Nuclear Project. San Antonio should not spend tax-payer money on nuclear power plants or coal power plants. Nuclear and coal power plants are polluting, expensive, centralized megaprojects and have a long build time. Corporate and institutional interests have far more access to the politicians who appropriate capital expenditures while taxpayers have no equivalent forum in which to be heard. This overly restrictive and preferential system allows the industry to reap the profits associated with selling power while taxpayers are forced to back most of the costs and risks associated with mining, building, and storage. This is not free market capitalism. This is risk without benefit for taxpayers. Taxpayers, not ratepayers, are actually assuming the risk. Taxes will pay for energy that the taxpayer never sees or uses. Ratepayers should pay for the energy they receive; taxpayers should not pay for energy they do not benefit from. We believe the ratepayers should be included in this decision because we will fund the construction, pay for the extraction of the fuel and pay to secure the resulting waste for millions of years. Ratepayers are on the hook for these risks. Ratepayers should be able to make this decision. There is a lot of “myth-information” about nuclear power. Here are the most common ones. Myth: Nuclear power is cheap. Myth: Nuclear power is clean. Myth: Nuclear power is safe. Myth: Nuclear power is secure. Myth: Nuclear power is sustainable. Myth: Nuclear power creates local jobs. Myth: Nuclear power is reliable. Myth: Nuclear power can be implemented quickly. These statements are not true, but are put out by the nuclear industry and, incredibly, by our publicly-owned utility, CPS. We present our findings, with sources, and respectfully ask you to consider them. The truth: Nuclear power is expensive. CPS has said repeatedly at recent board meetings that nuclear power is the “least risky” option for providing its ratepayers with new energy. Nuclear power is very risky in almost every aspect we have considered, making this sound as if CPS is trying to sell us on nuclear power, rather than allowing us to evaluate it objectively. We can start by looking at the reactors already built at the South Texas Nuclear Project. “Nuclear power, once claimed to be too cheap to meter, is now too costly to matter.” (The Economist Magazine. May 19, 2001, Cover story). If the money doesn’t come from private investors, then from where does it come? 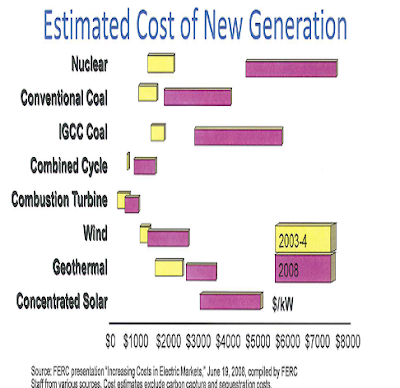 In the Energy Policy Act of 2005, Congress insures against accidents by extending Price Anderson Act until 2025 which insures utilities against catastrophic accidents with federal money; private insurers won’t take the risk, gives 1.8 cents per kWh production tax credit for first 6,000 MW of new nuclear generation for first 8 years of operation, insures utilities for construction delays due to hearings or litigation, provides $2 billion for uranium enrichment ventures (private sector refused to finance), promises to store nuclear waste, has collected only $20 billion in nuclear waste fund from industry (ratepayers), yet not provided a viable facility. (The National Academy of Sciences says $100 billion will be needed, The nuclear industry is suing the federal government for not providing a facility). How can CPS possibly claim that nuclear is the “least risky option”? From 1984 to 1993, electric utilities in states with nuclear construction projects wrote off in excess of $17 billion for abandoned plants throughout the country. If utilities admit that a nuclear plant is more costly than other options they would sound unwise, so they say it’s the “least costly” of the options considered. Remember, CPS told its board “nuclear is the least risky option” of its choices? The primary requirement of a utility is to act with prudence. This is a legal term for public utilities. Utility rate-making law is founded on the principle that a utility is allowed to recover from ratepayers all costs which are prudently incurred. Costs judged to be imprudent may not be recovered from ratepayers. In the 1980s alone, state commissions disallowed from utility rate bases more than $7 billion of nuclear costs due to construction imprudence. Another $2 billion in nuclear costs were disallowed due to the imprudence of building new capacity that was in excess of what was needed when completed. 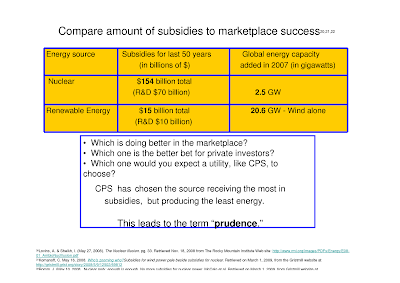 What effect do subsidies used with imprudence have on local economies? Utilities pass them on to the ratepayer. 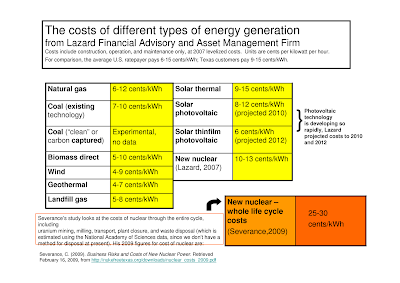 Nuclear megaprojects may charge customers during construction, who then pay for zero watts of energy. Higher rates risk lower demand; customers do without (efficiency) or make own (renewables) which adds up to imprudence. Credit ratings go down, financing for further projects is unavailable, investors don’t invest, developers are driven to high debt ratios. Growth is stymied and the entire economy of the area is downgraded. What does business have to say? The truth: Nuclear is not cheap. Nuclear is astoundingly expensive. The Myths of Nuclear Power: Nuclear power is clean. The truth: Nuclear power pollutes in some of the most dangerous ways known. Nuclear energy pollutes when it releases radioactive gases and liquids, both routinely and accidentally and when it leaves behind tons of deadly, long-lived waste. We need a short, (painless!) lesson here, to understand how radiation works. Radioactive substances (radionuclides) are elements that are unstable. Imagine them as a person trying to hold onto twenty billiard balls at once. They will feel one falling, move to catch it, and in the process start to drop another. This is an unstable arrangement. If the person drops a few of the billiard balls, he finds he doesn’t have to exert as much energy to hold on to fewer of them. Elements are made of atoms that are unstable like this. They have so many particles that it takes too much energy to hang on to all of them. Radioactive elements also release particles and energy to be more stable. It is these particles and rays of energy, released from atoms of elements, that are radiation. Radioactive elements all produce radiation that is harmfully energetic (meaning it destroys the normal functioning of living cells – which are what keep us alive). Again, you can think of it like two people playing dodge ball. The harder you throw the ball at the other, the bigger the bruise. When strong energy hits a living cell it can kill it, damage it, or cause the DNA codes to be disrupted so the cell does not function properly. The more energy, or the more times it hits, the more damage done to the cell. We need these cells to be healthy; they manage the processes that keep us alive. When they are damaged, that part of the body doesn’t work. Cancer occurs when cells multiply rapidly and needlessly. Cancer in a body disrupts the activity of healthy cells, and causes the death of the whole organism. The nuclear industry, however, is being purposefully disingenuous when it implies that a little radiation won’t hurt you. Even natural radiation that is energetic enough to disrupt cell function is harmful. We aren’t protected when we fly at 30,000 feet, but most of us are willing to take the risk of a little exposure to have the convenience of fast travel. The government sets the standards, and we live with the risk. We all choose to take risks, it’s part of life. However, we should know which risks we’re taking and be given the choice as to whether to take them. When we choose to drive a car, we know that many people die in automobile accidents. We try to minimize the risk by wearing seatbelts, taking driving lessons, and not drinking alcohol, but we know it’s there when we make the decision. What is not acceptable is when a small group of people decides for us which risks we’re going to take and isn’t honest about the consequences. That is what is happening with nuclear energy. A relatively small group of utilities, corporations, and the politicians that they lobby, have decided the amount of radiation we, the public, will be exposed to. They are doing it to make a profit. And we don’t know when we’re exposed, because radiation can’t be felt, smelled, seen, or heard. We don’t know when we’re getting it or how much we’re getting. Releases radioactive gases and liquids routinely. Strontium-90 is released in small amounts daily, large amounts during accidents, is treated like calcium by the body which concentrates it in any kind of milk, breasts, and bones, causing cancers years later. Its radioactive dangers last 600 years. Iodine-131 is quickly absorbed by thyroid, especially in children. Potassium iodide tablets lower risk of thyroid cancer, but are seldom made available. Cesium-137 acts like potassium in the body, is captured by muscle cells and causes cancer. Dr. John Gofman, discoverer of uranium-233, estimates that 100 reactors operating for 25 years, preventing cesium leaks 99.9% of the time, would still release enough cesium to equal 4 Chernobyl accidents. Plutonium-239 less than one millionth of a gram will cause lung cancer if inhaled, resembles iron, so body sends it to bone marrow, and causes blood cancers such as lymphoma or leukemia, It is stored in liver and causes liver cancer. Being teratogenic, which means it enters a developing embryo through the placenta it can be stored in testicles causing mutations in offspring and testicular cancer, as a half-life of 24,000 years, making it dangerous for over a half million years. Tritium as a gas is easily absorbed through skin, Tritiated water (1,360 curies released yearly) is an isotope of water, so it is absorbed like water in the cells, can be ingested in food, water, inhaled, or absorbed through skin, dangerous for 120-248 years,Taken in by plants, and animals in environment; bioconcentrates in food chain, causes tumors in lung and digestive tract, shrinks testicles and ovaries even at low doses, causing birth defects, mental retardation, Down’s Syndrome, smaller brains and deformed fetuses, and reproductive loss in offspring Some of these radionuclides, like plutonium, are extremely long-lived. It’s half-life is 24,000 years. Radiation is measured in curies. For reference, a large medical center with 1000 laboratories may have a total of 2 curies of radioactive materials. The average operating nuclear power reactor, by contrast, will have around 16 billion curies in its reactor core. This is equivalent to 1000 Hiroshima bombs. The nuclear power industry routinely releases millions of curies yearly. We’ve been describing planned releases. Accidental releases happen all the time and are called “incidents” by the industry. They occur due to human or mechanical error. As our fleet of nuclear reactors age we can expect to see more of these “incidents.” Metal fatigue causes structures to become fragile and brittle, and the radioactivity inside a reactor is intense. Even more concerning is the fact that the Nuclear Regulatory Agency (NRC), which monitors the industry is planning to extend the time reactors can be used from 30 to 70 years, and decrease the number of safety redundancy requirements from 5 to 1. Nuclear energy also pollutes when it leaves behind tons of deadly, long-lived, radioactive waste. The U.S. has now produced over 77,000 tons of waste from nuclear energy production. by 2020 France expects to generate 1.9 million cubic meters annually. England produced 470,000 cubic meters as of 2005, enough to fill the Albert Hall 5 times over. 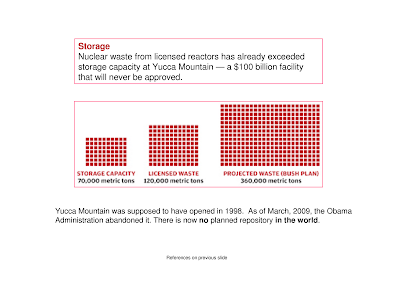 The only repository in the world that has been (partially) built to store nuclear waste is Yucca Mountain, a site in Nevada100 miles from Las Vegas. This site is geologically active, prone to earthquakes, collects moisture inside the mountain causing rust on metal containment vessels. The National Academy of Sciences doubts the accuracy of data collected at the site. It will only be able to hold the waste already generated. Nevadans have fought for decades to keep the waste out of their state. No one around the world is requesting to host a high-level nuclear waste dump. Land used to store nuclear waste is land sacrificed; it will never be used by humans safely again. (Sussex, A. February 2003. The Road to Yucca Mountain: Nuclear Waste and Terrorism. CNN.com Inside Politics. Stranahan, S. Nov. 13, 2008 Nuclear Delusions, pg 59. Rolling Stone Magazine. Senator Harry Reid. June 13, 2001. Yucca Mountain site poses many problems. Accessed on March 7, 2009, from The Hill website. To be continued... The original ppt is 128 slides long.